Make your bucket airtight and leakproof! Protect your feed and supplements from moisture, insects, vermin and pesky animals! Transport buckets of water without leaking! Transforms ANY standard 12" diameter bucket into an airtight, leakproof storage container. 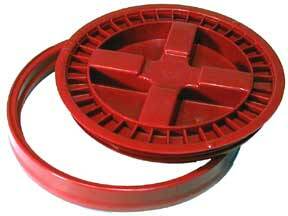 All you need to do is snap the adapter onto your bucket and spin the removable lid. Specially engineered gaskets ensure the lid and adapter are properly sealed to provide airtight protection. Fits 3.5 to 7 gallons. Available in WHITE (and a very limited supply of BLACK).